Native to California. Seeds are poisonous, containing toxic concentrations of nitrates. Causes nausea, blurred vision, digestive upset, and coma. Some species also contain lysergic acid amides (similar to LSD) that can cause confusion, hallucinations, lack of coordination, and stupor. Morning Glory seeds are readily available from your local nursery. 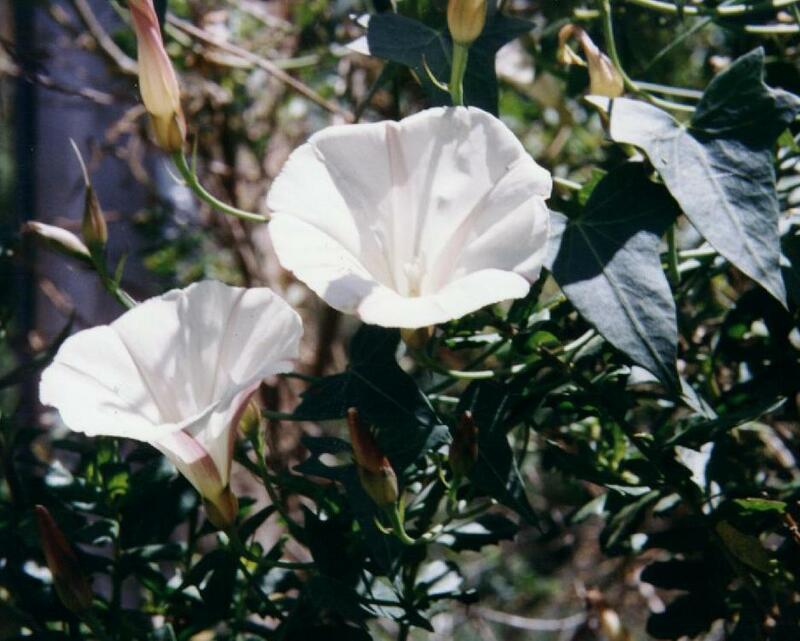 The morning glory referenced on my site grows wild, and is the Convolvulus occidentalis species. It is not psychoactive. If you are looking for seeds that contain Lysergic Acid amides, you want Ipomoea purpurea, or Ipomoea violacea, or Rivea corymbosa. Most of the seeds you get from the nursery will have been treated with fungicides, which are difficult to wash off (you would need detergent and cold water, but don't risk it). Moreover, there are toxins in the seeds that produce headaches, blurred vision, and nausea, and these are not all that easy to extract out of the seeds. People grind them up, shake them up in Naptha for a few hours to get rid of the headache and blurred vision toxins, then dry the powder and extract the LSA using high grade ethanol (the ethanol is then imbibed to get the psychoactive effect). Altogether not worth the trouble. You'd have more fun sucking the nitrous oxide out of whipped cream cans, and your brain would be back to normal in 5 minutes instead of 12 hours. As I biochemist, most of the requests I get for Morning Glory information is from people looking for recreational drugs. I jumped to that conclusion in your case because you didn't specify and particular species, or even flower color. Most of the drug users know about the fungicides, and are not particularly interested in the subsequent liver transplants required, and so are looking for 'organic' sources for the seeds. The only way to be sure is to grow them yourself. But if you don't prepare them properly, all you will get is a headache and a blurry, gut-wrenching trip to the bathroom. If you are interested in Convolvulus occidentalis, please reply to this mail with any specific requests. I answer all my mail.